We hear about microfiber towels all the time, but few of us actually know what the heck microfiber is. Because we include premium microfiber towels with several of our products, we’ve assembled this brief introduction to microfiber so that you can impress (or bore) friends at parties! Microfiber is a synthetic fiber, usually produced using polyester, polyamide, or a combination of the two. Fibers are measured in denier, which is a reference to their linear mass. Sound awesome? We didn’t think so. The easiest way to think of microfiber is that they’re finer than a strand of silk, which is 1/5 the diameter of a human hair. So in other words, it’s pretty small. Ultra-fine fibers have been in production since the late 1950’s, but weren’t commercialized until the production of Ultrasuede in the 1970’s. Microfibers finally achieved universal success after their adoption in Sweden and later the rest of Europe during the 1990’s and now they’re a commonly accepted part of our cleaning arsenals. 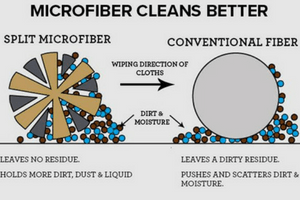 What is the appeal of microfiber? Because producers of microfiber have control over the final product, they can use various techniques to achieve fibers that are soft, tough, absorbent, water repellent, or more – the applications are broad. We’ll stick to our favorite use: cleaning! To achieve great cleaning results, microfibers are split during production. If you looked at a cross-section of the fiber it would look like an asterisk whereas a cotton fiber would just look like a circle. Those grooves allow the cloth to trap dirt and absorb liquid as well. An additional benefit of microfiber compared to cotton is the absence of lint. If you’re cleaning glass or any highly reflective surface like granite, stainless steel, or the surface of a car you’ll want to use microfiber. Most products won’t mention whether or not the fibers are split, but you can easily test with a few drops of water. Put the water on any hard surface and try to push it with your microfiber cloth. If the water is absorbed then you’re dealing with split fibers. If the cloth pushes the water around then the fibers are whole, and your cloth is not meant to be absorbent. Are you a fan of microfiber cloths for cleaning? Let us know in the comments! With hot water, dawn soap, and vinegar wash with microfiber and dry with microfiber towel streak free.